A lovely story which reminds me of my first acquaintance with Christian anarchism in present day Europe, the Ploughshares Movement - a judge who showed respect for the motivation of the axe man. Rare, but not impossible. Bazaar called the Strategic Space Symposium in Omaha NE, Nov 2-4. After the statement was read a number of people, including the 8 who were arrested laid down on the ground in front of the banner, enacting a “Die-In”. 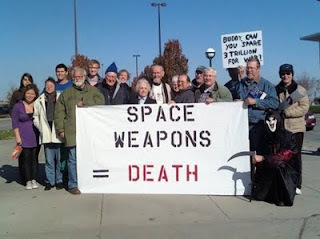 After 5 minutes people were called to their feet and directed to take the “Die-In” into the Qwest Center where the Space Weapons Bazaar was taking place. The protesters were stopped just inside the front doors by Qwest security people and Omaha police officers. The protesters proceeded to reenact their “Die-In” just inside the building at the feet of the security people and police. Our statement was reread. Qwest security people informed all protesters to leave the building or face arrested. All but eight people left the building. Each of the eight was asked by an Omaha police officer to leave the building or face arrest. All eight were place under arrest, hand cuffed and walked out the of the building into a police van or police car. 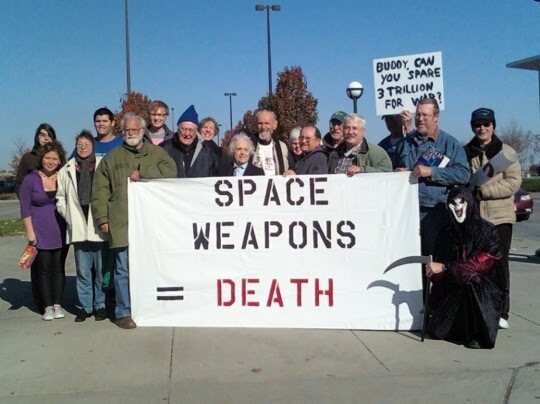 The four out of state “Space Weapons Bazaar” protesters who were arrested Wed. Nov 4th at the Qwest Center in Omaha spent the night at the Douglas County Jail. We were Fr. Louis Vitale of CA, Fr. Jim Murphy of WI, Steve Clemens of MN and me Frank Cordaro of IA. We were all charged with a City of Omaha ordinance “20-155 Request to Leave” a misdemeanor offense with a maximum penalty of six months in jail and/or a five hundred dollar fine. On Wed Nov 5th we appeared before Judge Darryl Lowe in what is called ”jail court” with sixty other Douglas Co Jail inmates at 1:30 p.m. for what turned out to be the most entertaining and perplexing two hours I have ever spent in a court room. Jail courts are the places where people who get arrested and booked into county jails, and do not bond out, get to see a judge for the first time. This is the time when most inmates can plead guilty or innocent, be assigned a court appointed attorney and have their bail reviewed. The vast majority of inmates who appear in these jail courts are poor and people of color. Ninety percent plead guilty, knowing ”you get the justice you can afford” in this country and if you’re poor, you’re better off pleading guilty and doing the time up front than pleading innocent and doing more time awaiting trial, a trial in all likelihood you would end up losing whether you are innocent or not. It’s not a pretty picture to watch. It’s often done with out feelings or human concerns for those being judge. This time it was different. The officer who talked to the sixty of us before we were lead into court told us that Judge Lowe is a very different kind of judge. “He’s liable to ask you the strangest of questions.” The officer was not wrong. In the two hours we spent before Judge Lowe he made inappropriate comments, asked questions way beyond the scope of his professional obligation as a judge, and delved into people’s personal non-legal issues. Yet Judge Lowe was also one of the most caring and humane judges I have ever seen work from the bench. Beyond his extremely large public, entertaining ego, he showed real concern for the people who stood before him. For those who plead guilty, he went to great efforts to find a sentence that really matched what the inmate needed in order to make right for the crime committed and help them get their lives back together. Judge Lowe meted out justice that day unlike I have ever witnessed in a court of law. It was justice with a heart. As the two hour session was coming to a close it was clear the judge was speeding up his pace, wanting to be done by 3:30 p.m. The order of the cases was presented to him from the most serious to the least serious. We four protesters were the last four cases of the day. We were all in our orange jail-issued outfits. By the time Fr Louis Vitale was called to the bench we were the only ones left in the court room, with the judge, the prosecutor, the two court recorders and the four jail police officers. “No contest,” said Fr Louis. Fr Louis was dumbfounded. He tried to explain to the judge that all he wanted to do was make his plea and ask that the sentencing be postponed until the four local Omaha people went to trial. Fr Louis needed to be on a plane Saturday morning for a speaking engagement and Mass obligations Sunday. A five day sentence would make it impossible for him to make his commitments. Judge Lowe would hear none of it. He pounded his gavel and told Fr Louis if he wanted to appeal the sentence he would have to come up with a $100,000 bond! “Next,” shouted the Judge Lowe as the guards led Fr Louis out of the court room. “Three days” said Judge Lowe pounding his gavel. “Next!” shouted Judge Lowe as Fr Jim was lead out of the court room. Steve Clemens approached the bench. By this time everyone had a chance to catch their breath. Judge Lowe finally asked Steve, “What were you guys doing at the Qwest Center in the first place?” Judge Lowe just assumed the four of us were arrested for intoxication. He just thought we were four old drunks. “Catholic priest! Protest!” exclaimed Judge Lowe as the blood went out of his face, “Bring those two priests back before me. Give me their files.” The judge asks me to join them all at the bench. We explained to him what our nonviolent protest was all about. He congratulated us for our witness. He said he believed in nonviolent civil disobedience. He said more of it needed to be done. He told us his father was active in the civil rights movement in the south. He added, “of course I was only four years old at the time.” He shook each one of our hands. Fr Louis knelt down with his hands raised in prayer and thank God for the Judge’s change of heart. I have never ever been treated so well. Justice, not necessarily the Law was served that day in the Douglas County Jail.